The Crimson looks to rebound after a disappointing performance against Cornell last week. A victory on Tuesday night would send the squad into the four-week winter recess above .500. WALTHAM, Mass. — The Harvard men's hockey team is hoping to unwrap a gift a few weeks early as it battles Bentley on Tuesday night searching for one last win before the four-week winter hiatus. 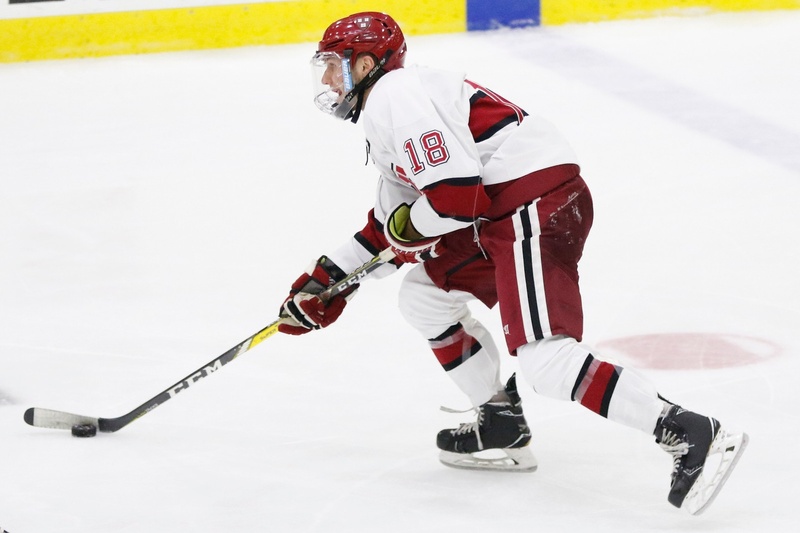 The Crimson (4-4-2, 2-2-2 ECAC) is coming off a disappointing performance against then-No. 16 Cornell and remains at .500 after splitting last weekend. The Falcons (5-9-1, 4-7-1 Atlantic Hockey) host Harvard for the first time ever. The home team faces a formidable Crimson attack that ranks in the top 10 in scoring nationwide boasts the country's top powerplay unit (38.6%). Junior defenseman Adam Fox (5–15—20), whose season-long point streak came to an end last Saturday against the Big Red, headlines the potent Harvard squad and paces the NCAA in points per game (2.00) and assists per game (1.50). Also of note offensively, co-captain Lewis Zerter-Gossage (8–2—10) is tied for second in Division-I goals, and freshman winger Casey Dornbach (2–13—15) is second behind only Fox in assists per game (1.30). In short, Bentley will have its hands full against the Crimson, a team looking to bounce back from Saturday's loss and end the 2018 portion of its schedule on a high note.